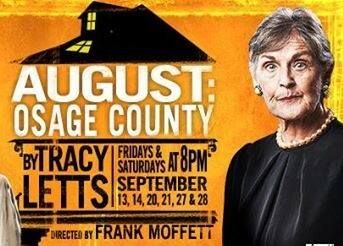 The Footlight Club’s production of Tracy Letts’ August: Osage County, staged at Eliot Hall in Jamaica Plain, leans more heavily towards the exhausting, grinding facet of living through a dysfunctional family’s foibles than towards the uneasy, occasionally violent expression these foibles give way to. The audience is led through the darkly funny strangeness constantly burbling in the home of Beverly (Troy Siegfreid) and Violet Weston (Renee Miller), figuratively aired out for the first time in decades after Beverly mysteriously goes missing and the family cautiously comes together in response. The show opens, and we see the interior of a large old house, sliced in half, exposing a porch, study, dining area, second floor landing, and attic bedroom. I use the word “old” broadly, since it’s not quite a simple matter to determine time in that house. We see an old-fashioned study stuffed full of hardback books, papers scattered everywhere, the den of the patriarch we only meet once. We see modern elements, most notably the TV center stage, a record player which occasionally churns out the tunes of Eric Clapton during the performance, a pull-out sofa. But it is clear that the windows Violet has insisted on taping up, preventing sunlight or ventilation from entering the house, have managed to keep time out as well. The actions and the characters that perform them feel suspended, both in a soupy heat and in something indefinably menacing in its stultifying stillness. Meanness, barbed wit, and F-bombs fly in this vivid production, directed by Frank Moffett. Beverly’s disappearance causes the family to slowly trickle in one by one: Violet’s long suffering local daughter Ivy (Erin Stulb), Violet’s sharp-tongued sister Mattie Fae Aiken (Veronica Anastasio Wiseman) with husband Charlie (Paul Cambell) in tow, Ivy’s sister Barbara, her benign husband Bill (Edward Batutis) and attractive, pot-smoking daughter Jean (Jessa Campbell), and third sister Karen (Rae McCarey), recently affianced, form a mismatched, reluctant pageant that marches through the porch doors of that infernal Oklahoma house. This production makes up in moments what it lacks in momentum, steadily revealing the strain underlying the cracked foundations of the Weston family and its relations, delivering consistent tension if falling short of actual punches to the gut. But it was in conjunction with Barbara Douglass’s performance as Violet’s daughter that sparks really flew. The two women bicker, fight, even resort to blows, and in the smoke that rises from the impact site it becomes increasingly difficult to distinguish who has caused more harm to who. Douglass is a dazzling presence on stage, easily the most humorous and powerful performance in the play, the rising matriarch unwittingly overseeing the final descent of the previous one. Her increasingly futile attempts to keep the lid shut on the Pandora’s box of Weston bile and secrecy Violet tries to pop open may account for the fact that the funny moments in Act II hit their mark much better. This may also be due to the brief instance where almost every character is on stage during the funeral dinner, or perhaps to the snappier pacing which necessarily surrounds the revelation of shocking secrets. Act II unfortunately also bore witness to the production’s main weakness. I would argue that the most ineffectual aspect of this production was the physicality of certain aggressive scenes, particularly those of argument amounting to violence. It was a Pinter-esque set-up without the classic Pinter-esque pitch: if your husband doesn’t seem to really be physically restraining you, I have no reason to believe you are about to really physically assault your future brother-in-law who was caught canoodling with your fourteen year old daughter. Perhaps better staging could have made Barbara’s attempts to strangle her aged mother in front of the whole family seem more threatening without endangering any actors. That being said, the play’s effectiveness is not dependent on a mere matter of fisticuffs. The sparing moments of emotional connection reveal much comedy, and even hints of tenderness. The various interactions between the three sisters were high points throughout this production. McCarey, Douglass, and Stulb make fit companions to Miller on the production poster: after all, the women in this play are the ones who run the show. McCarey in particular displayed fantastic comedic timing in the scene where Karen, Ivy, and Barbara share a rare moment of sisterhood after dinner, an uneasy truce temporarily established. Karen’s incessant chatter in the opening of Act II not only makes for convincing comic relief; it also made Karen’s farewell to Barbara post-pot-party-gone-awry poignant and compelling. We believe McCarey’s Karen as she looks Barbara in the eye, implicitly recognizes her inability to abandon her delusions about Steve, and enigmatically assures her shocked sister that she will have her very own moment “down here in the muck.” It’s the price you have to pay to hold on to your much-fought-for happy ending. As difficult as it is to tear our eyes away from the Weston women, my honorable mention for this production centers on Candis Machia’s delightful portrayal of the stoic Johnna. From the very first moment, we see Johnna quietly listening to Beverly’s drunken monologue, expressing no overt discomfort except to wipe her forehead in response to the stifling heat of the taped-up house. Whether she was serving the family meals or attacking Karen’s fiancé Steve (Randal Divinski) with a frying pan, Machia’s Johnna displayed a poise and control that never came off as dull or unengaged. I found it particularly moving that, while Barbara, Violet, and Ivy were duking it out with plates of uneaten catfish, Johnna, quietly, painfully, almost imperceptibly, to the sounds of shouting and plates crashing to the ground, quietly finished her dinner and lay down on her bed in the attic, unnoticed, understated, yet undeniably present, as the play’s last moment emphatically asserts. Wry in its humor, bleak in its honesty, unflinching if not powerful in its brutality, the Footlight Club offers an evening of little comfort and much turbulence in its production of Letts’ play. Consider it a rare chance to attend a unique family reunion: one in which you are spared from being involved and blessed in your ability to openly squirm in discomfort and safely exult in well-aimed, well-deserved insults aimed at every participant and observer but you.